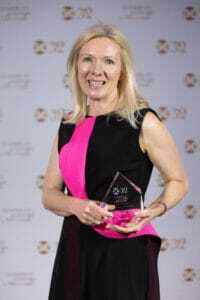 Deutsche Bank’s global head of securities services and chief country officer for Ireland, Fiona Gallagher, has won the third annual Global Custodian Industry Person of the Year award. The award honours individuals who have gone above and beyond in the securities services industry throughout the year, with this year’s shortlist also including representatives from State Street, SIX Exchange Services and new collateral mobility blockchain firm, HQLAx. In the closest vote in the award’s short history, Gallagher prevailed by a single vote, as a room full of securities services experts had the final say on the winner from the esteemed shortlist. “I am incredibly humbled, honoured and privileged to have won this award from Global Custodian. I owe a massive debt of gratitude to our clients, and the Deutsche Bank team for all their support, innovation and partnership,” said Gallagher. Deutsche Bank restructured its securities services division at the beginning of last year, after its global head of the unit stepped down in December 2017. The bank decided to look internally, and in April appointed Gallagher, its head of global transaction banking for Ireland, to the role. Under Gallagher’s leadership, Deutsche Bank is also looking to take on the FinTech community head-on with a new analytics tool, allowing it to analyse millions of lines of securities transactions data on a daily basis. Deutsche Bank’s next aim for its data analytics services is to address settlement fails, as the impending Central Securities Depository Regulation (CSDR) looms. Under Gallagher’s leadership Deutsche Bank has sought to break the mould of custodian banks being too big and complex to change with innovation at the forefront of its future plans. The shortlist for the award was Global Custodian’s most diverse, with candidates from a global sub-custodian, a global custodian, a market infrastructure and a FinTech firm. Previous winners of the award at the event have been Justin Chapman of Northern Trust and Pervais Panjwani of Citi. The North American equivalent was won by Kelly Mathieson of Digital Asset Holdings in 2018 and Peter Cherecwich of Northern Trust in 2017. On the night, Deutsche Bank also took home three other awards from Global Custodian’s agent banks survey categories. In emerging markets for relationship management, the bank scooped awards for Asia-Pacific and MENA, while also earning a continued excellence award for the former, in a category assessing historic performance in the surveys as part of Global Custodian’s 30th anniversary.